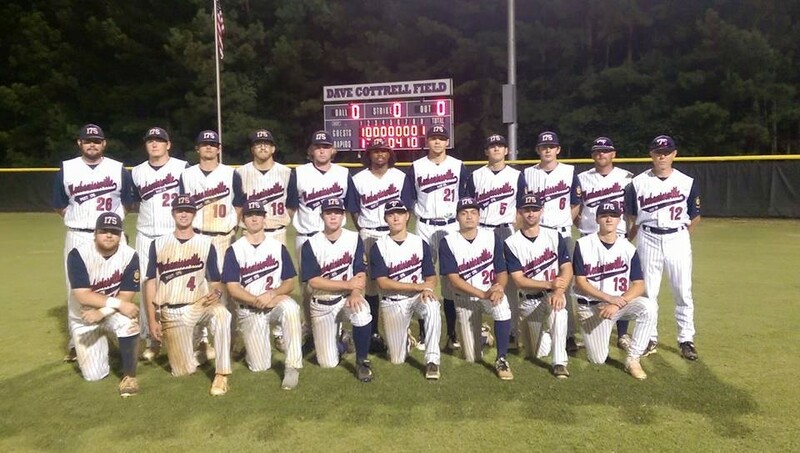 After pounding the host Fredericksburg Post 55 Eagles Friday morning 17-3, Mechanicsville Post 175 earned a rematch with the team they lost to earlier, way earlier in the calendar day: Albemarle Post 74. And, after falling behind early 6-2, Post 175 scored five runs in the fifth to take an 8-6 lead. They carried an 8-7 lead into the ninth, ready to force a winner-take-all game on Saturday. Then the wheels fell off. Again. Two errors, two wild pitches, a passed ball and a catcher's obstruction call equaled doom for Mechanicsville, as the defending Legion state champions rolled to eight runs in the inning. Shellshocked Post 175 went down quietly in the bottom of the ninth, seeing their season end in very disappointing fashion, 15-8. Mechanicsville ends a very, very good season at 21-4, but will spend time now as the team goes its separate ways to colleges and their respective county high schools wondering what went wrong and why, when they needed it the most, defense and pitching fell apart. Justin Bishop placed Mechanicsville in the position to win with six and a third innings of strong relief. But Cody Thompson struggled in the ninth, replaced by Stephen Hurd who allowed a wild pitch and passed ball in a brief appearance. The team will lose several key players as their eligibility in American Legion baseball runs out, including Thompson, Haiden Lamb, Josh Lam, Andrew Sergent, and Josh Shepherd. 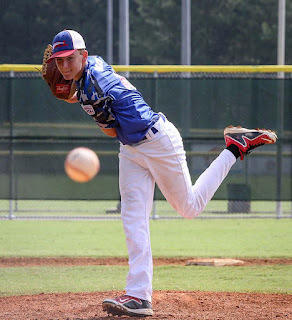 Mechanicsville Post 175 had played stellar defense to go with strong starting pitching and live bats in their first two games, both wins, at the American Legion State Tournament. But on Thursday night, and early Friday morning, Mechanicsville's defense let them down, and the result was their first defeat of the postseason, placing them a loss away from the end of the road. 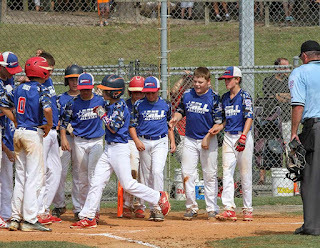 Six errors, and six walks, helped Albemarle Post 74 quickly erase a 3-0 fourth inning Post 175 lead, then pushed in the winning run in the bottom of the ninth, advancing to the championship round with a 4-3 victory. Mechanicsville scored all three of their runs in the fourth as Josh Lam blasted a solo shot to lead off the frame. Stephen Hurd next reached base on a wild throwing error by the pitcher, advancing all the way to third. He scored on a Brandon Crosby groundout. Cody Thompson and Andrew Simpson walked, Hayden Moore advanced Thompson to third on a deep flyout to center, then Thompson scored when Moore tried to steal second, getting caught a in rundown long enough to get Thompson across the plate. But in the bottom of the fourth, Albemarle struck for three. Around three strikeouts for starter Brett Ayer were two walks and three key errors. Albemarle tied the game with just one hit, a two-run single from Cody Spencer with two down. Mechanicsville stranded a runner at third in both the seventh and eighth, and after a two-out, ninth inning double from Haiden Lamb, couldn't get him across. Reliever Justin Bishop, who entered in the sixth, saw a ball go just under Crosby's glove at short to lead off the ninth. After a bunt line out that almost became a double play, Spencer walked, then Chris Hughes launched a high fly down the left field line. In the lights and descending fog, Moore lost contact with the ball, and it landed in fair territory, allowing the runners to move forward. The winning run was at third. Leadoff hitter Dylan Shifflett extended his at-bat to a full count, then Bishop sent a pitch too high allowing the winning run to score. Mechanicsville turns around quickly to face the host Fredericksburg Post 55 Eagles at 10am back at Riverbend High School. With a win, they will get a rematch with Albemarle immediately following early in the afternoon. 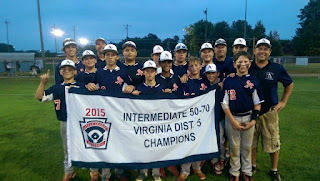 They must defeat Post 55, then Albemarle both Friday and a potential winner-take-all game Saturday morning if they want to claim the state title. Most Hanover Hawks baseball fans have seen Hayden Moore as the closer. But a summer project of his this year when joining Mechanicsville Post 175's American Legion baseball team was working as a starter. Wednesday night, the rising senior showed he's ready to tackle any task on the mound. Retiring eleven batters in a row at one point, Moore went seven strong innings while Post 175 consistently found ways to score, while South Richmond Post 137 frustratingly left runners on base, as Mechanicsville won the District 11 Tournament Championship for the third time in four years with a 10-2 victory. "Coach told me yesterday when I called and asked him when the game was," Moore said. "He said it's at seven and you get the ball." He made the most of the opportunity, allowing just two hits over seven innings. Meanwhile his offense gave him all the cushion in the world, tying the game at 1-1 in the bottom of the first on a Brandon Crosby RBI groundout scoring Haiden Lamb, who walked and stole both second and third. Then, in the second, Cody Thompson (Atlee/Randolph-Macon) launched a solo home run to left center to give Post 175 the lead for good, helping to chase 137 starter Will Midgette. Reliever Trent Kochheiser was greeted by Aaron Saunders with a double deep to center, scoring Andrew Simpson who also doubled, and Lamb, who got aboard with a hit by pitch. Mechanicsville scored one in the fourth, then broke the game open with four runs in the sixth as Lamb, Saunders, Crosby, Eliott Sledd and Josh Shepherd each reached base on hits, four singles and a double (Sledd) in all. Post 175 is now 18-2 and moves on to the American Legion State Tournament, scheduled to begin Monday in Fredericksburg. When the Randolph-Macon Yellow Jackets men's basketball team fell to Frostburg State on November 30th to go to 3-2 on the young season, no one leaving Crenshaw Gymnasium that afternoon could foresee how the next 25 games would go. The Yellow Jackets would win every game in December, then January, then February, completing their first-ever unbeaten Old Dominion Athletic Conference (ODAC) regular season. 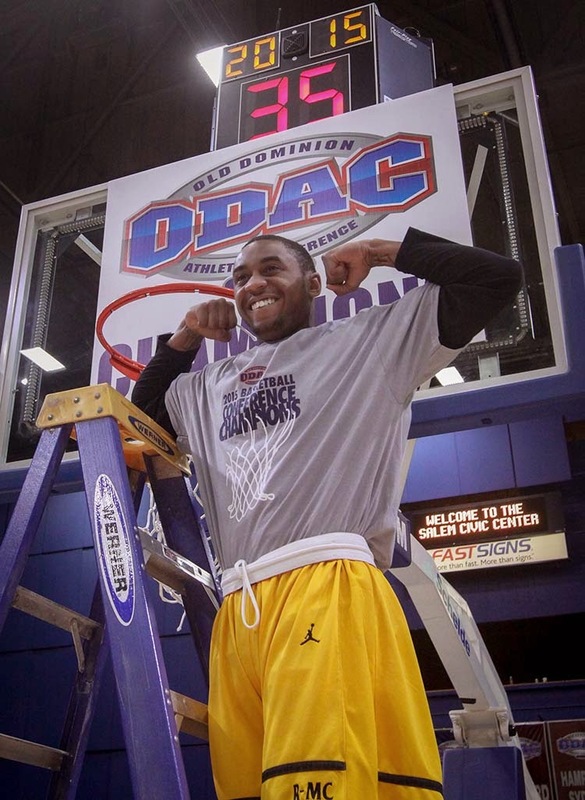 The streak began with a victory over Virginia Wesleyan in Norfolk, and continued in mid-January when the Yellow Jackets got a late three-pointer from senior point guard Marcus Badger to nip the Marlins in Ashland before a sellout crowd and regional television audience. To begin March? The ODAC Tournament Championship on an icy Sunday in Salem as the Yellow Jackets against faced the Marlins, playing behind most of regulation. Randolph-Macon forced overtime, then was able to put away Virginia Wesleyan for the tournament title 81-74 with Badger named the tournament MVP. Randolph-Macon was the number one team in America in Division III entering the NCAA Tournament, earning a first round bye and home game in the second round, where they eliminated Catholic 78-65. 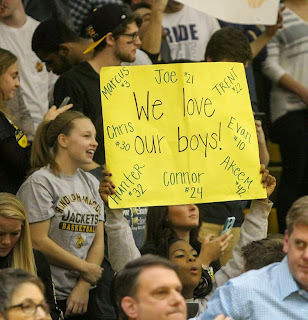 The Yellow Jackets next hosted one of four sectionals in the Rounds of Sixteen and Eight, defeating St. John Fisher to set up the fourth meeting of the season with Virginia Wesleyan. 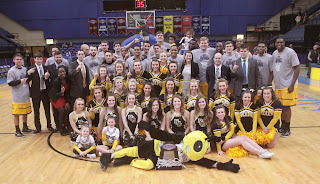 In a game that produced some of the fastest, tighest defense played by two teams over forty minutes at any collegiate level, Virginia Wesleyan overcame a 47-44 deficit in the final four minutes, holding Randolph-Macon scoreless to steal a 49-47 victory and a berth in the NCAA Division III Final Four, ending the Yellow Jackets' winning streak at 25, and their season at 28-3. It also turned out to be the final game for head coach Nathan Davis, who resigned just over a month later to become head coach at Division I Bucknell University. Badger and his seven senior teammates produced an incredible season for Macon Nation, shattering the record for most consecutive victories, a season maybe only surpassed by the Final Four teams of 1977 and 2010. 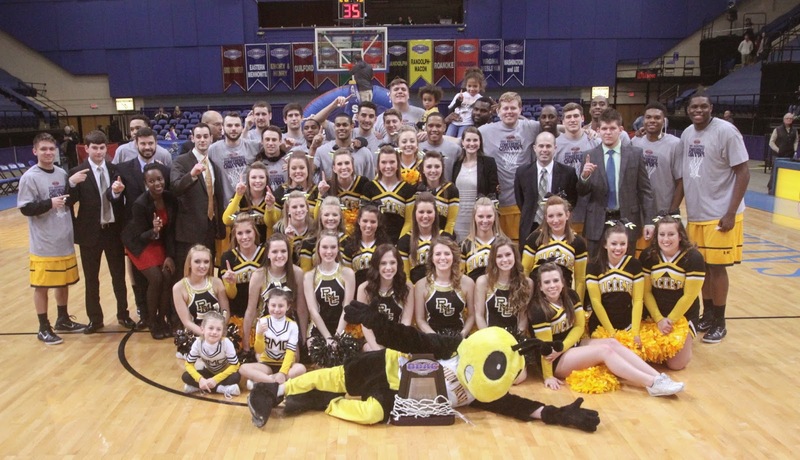 Randolph-Macon's 25-game winning streak and incredible four game series with Virginia Wesleyan, the #3 Biggest Event on RVA Sports Network in the 2014-15 season! 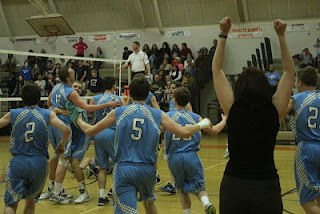 An expanded postseason for boys volleyball in 2014 meant more teams in the playoffs, and three state championships to vie for instead of just one, great news for teams like the Midlothian Trojans and Hanover Hawks, who now could play in their own classification rather than have to battle through teams from much larger high schools, which was what VHSL reclassification was all about. But few could predict in August that the Trojans and Hawks would dominate the 4A Boys Volleyball scene, and end up meeting a remarkable three times in the playoffs, with a trophy at stake each time. And fewer could see coming the fact that every match would be a nail biter, down to the fifth set tiebreaker. Hanover claimed victory at the Conference 20 championship. Then, a second meeting for the 4A "Western Section" title (akin to a Region title), which saw the Trojans come to Hanover, fall behind, then storm back for the five-set win. Each dispensed of their state semifinal opponent, setting up one final showdown on the afternoon of Friday November 21st at the Siegel Center on the VCU campus. Players fighting injury gutted it out one final time to try to take the ultimate prize back to campus. And it couldn't have been contested much closer, with the Trojans taking set one 25-21, the Hawks set two at 25-23, then Midlothian in set three 25-23, the Hawks taking the fourth encounter 25-19. Of course, there had to be a fifth set. It, too, was down to the wire, with Midlothian surviving at 15-13 to take the 4A State Championship. In the end, Midlothian won three of four matches against Hanover, including one in the regular season. Thank you Trojans and Hawks for our #4 Biggest Event of 2014-15 on The RVA Sports Network! When the Virginia High School League underwent its first total reclassification in 43 years in 2013, fans in Hanover County noticed that, with Patrick Henry in one region (North) in the new "5A" classification, and the other three schools in the other (South), the only way the Patriots would be a rival in postseason play would be, at the earliest, in the State Semifinals. Little did we know that in just the second year of the new system, the county would get a dream matchup, as Atlee softball worked its way through the 5A South Region, taking runner-up, while Patrick Henry won its second straight 5A North Region crown, meaning the Patriots and Raiders would battle for a trip to the 5A State Championship. So fans by the droves made the treacherous trek from Hanover to Fairfax on Friday June 12th to see Patrick Henry and Atlee do battle. For the Patriots, it was their third trip to the state semifinals in four years, going 1-1 in the previous two encounters. The game almost didn't happen. A torrential rain storm flooded the field at Robinson Secondary School just before game time, sending teams and fans into the school. Once it ended, the field crew proceeded to perform a miracle on the playing surface, and at 8pm, it was game on. In a back and forth battle, the Raiders prevailed 5-3 to advance to the 5A State Championship the following evening, where Atlee got revenge for a 1-0 loss to Hickory in the South Region final a week earlier, riding the pitching of Peyton St. George and a three-run single from Laura Kate Moss to a 3-0 win and the second State Championship in Raider history. The win sent head coach John Earley and assistant coach Becky Levy into their planned retirements, announced at the start of the season. It was their second state title, the first coming in 2002 in the old Group AAA format with Levy the head coach and Earley the assistant. Softball was, by far, the most successful sport in Hanover County in 2014-15, so it was fitting that two teams played at the state tournament level, and a county team brought home the trophy in our #5 Biggest Event of the season on RVA Sports Network! It's a brave new world for high school football in Hanover County. As Patrick Henry moves to the Capital District effective this fall for scheduling purposes, the Patriots are no longer "landlocked" into playing the other three county schools in September. Gone are longtime opponents like Hermitage, Deep Run and Douglas Freeman, replaced by the likes of Highland Springs, Varina, and Henrico. The Patriots haven't played the Springers or Blue Devils on a regular basis since the 1970s in their first stint in the Capital District, and dropped Henrico from their schedule in the early 2000s due to the opening of both Deep Run and Hanover. Look for major changes to the schedules of all four schools, and, due to the usual "two-year realignment" of schools by the Virginia High School League (VHSL), you'll note some teams must travel to county rivals for the second year in a row, most notably, Atlee going to Hanover again on September 25th and Patrick Henry having to play The Tomato Bowl in Mechanicsville for the second straight year, this time in the regular season finale on November 6th. Also, for the first time in county history, all four schools will play each other at the same time on October 23rd when Lee-Davis battles Hanover and Patrick Henry goes to Atlee. Since Hanover opened in the fall of 2003, two "in-county" games had never occurred simultaneously. To see any team's 2015 slate of games, CLICK HERE. NOTE: RVA Sports Network will begin announcing its 2015 "Game of The Week" broadcast schedule on Twitter next Friday, July 24th! District 11 officials try once more to get the regular season games in and push the start of the tournament back to a Saturday doubleheader format. All the information you need is listed below! At least three games scheduled for Monday night have become victims to the heavy rain that moved through Richmond late in the afternoon. Against a familiar foe, the Ashland Intermediate (50/70) All-Stars found both an arm to quell a comeback and the bats to clinch a championship. After losing a 7-1 lead in the fourth inning as Central Chesterfield scored nine runs, Ashland inserted Carlos Cervantes onto the mound. Cervantes struck out six, hit a leadoff triple in the fifth for a three-run rally to tie the game, then launched an RBI single in the sixth to score Jeremyah Simmons as Ashland ran away with a 21-11 victory to win the District V Little League Intermediate (50/70) Championship Friday night at Mechanicsville Little League complex. It was the second straight season that Ashland had to overcome Central Chesterfield for the title. 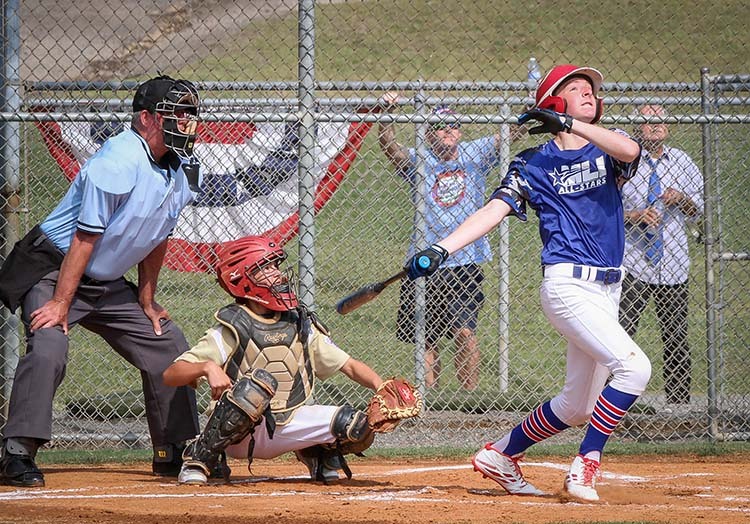 It will be an experienced Ashland All-Stars that report to the State Intermediate Tournament next week in Alexandria, hosted by the Fort Hunt Little League. Ashland was eliminated a game short of the championship bracket round in 2014. Two Hanover County teams captured Little League District V Softball championships Thursday night at Lee-Davis High School. 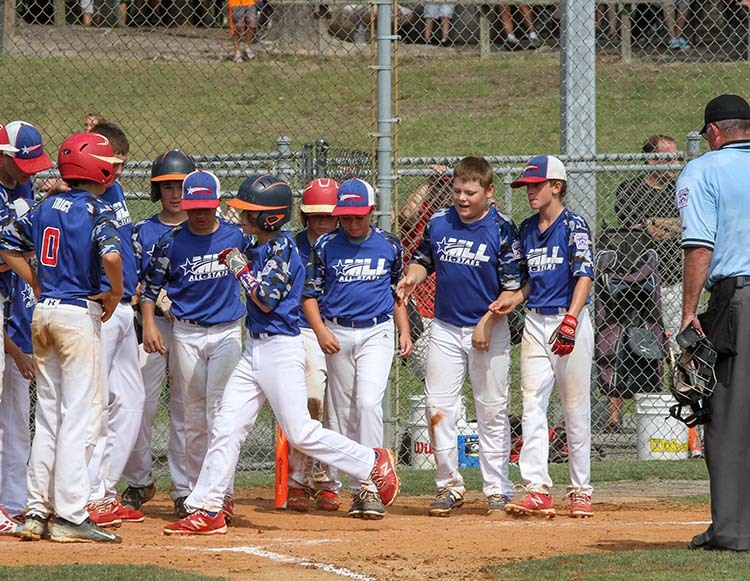 The Atlee Majors defeated Mechanicsville 10-0 to win the Little League division crown. Riley Dull led Atlee with a shutout performance in the circle. 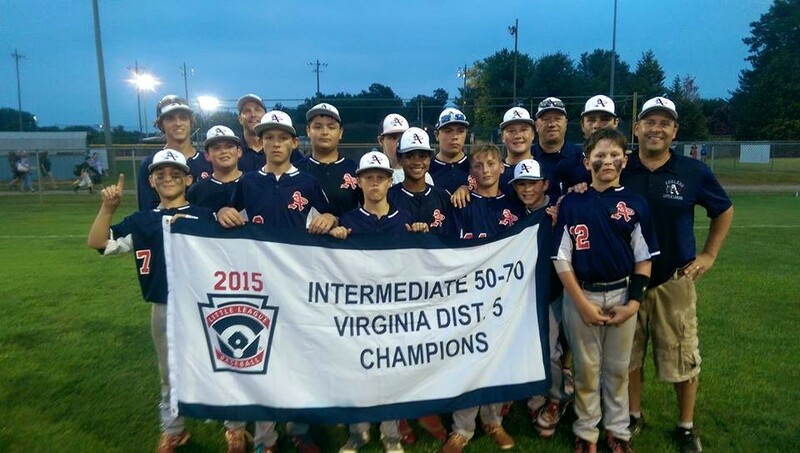 Atlee advances to the State Little League Tournament in Honaker beginning July 16th. The Mechanicsville Seniors eliminated Huguenot 18-7 for their District V championship, scoring six runs in the second inning to break the game open. 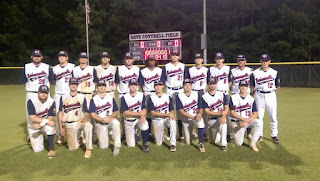 Mechanicsville repeats as District champs, and begin their quest for a state title next Thursday, July 9th in Damascus.